Development goals are best achieved when public and private sectors cooperate, as business opportunities and development policy initiatives often intersect. In the case of food standards, the public sector is responsible for creating adequate incentives and in providing a supportive policy and legal environment, so that successful implementation is possible for the private sector. 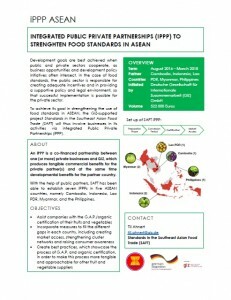 To achieve its goal in strengthening the use of food standards in ASEAN, the GIZ-supported project Standards in the Southeast Asian Food Trade (SAFT) will thus involve businesses in its activities via integrated Public Private Partnerships (iPPP).